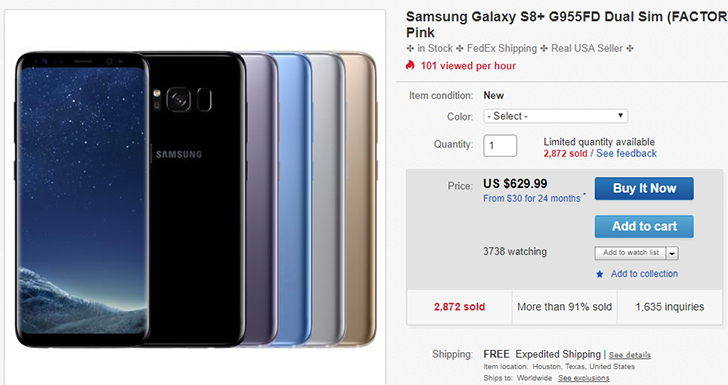 The seller in question is 'never-msrp,' who has a 99.5% positive feedback rating, so you should feel pretty safe buying devices from them. The exact model being sold is the G955FD dual-SIM Galaxy S8+, which has an Exynos 8895 processor with 4GB of RAM and 64GB of expandable storage. Since this is an international variant, you'll want to double-check your carrier is supported, but all major GSM carriers (AT&T, T-Mobile, etc) in the US should work fine. You can buy the S8+ from the source link below. It ships from Texas to a variety of countries worldwide.